Traditional turkeys are nearly flavorless when you skip the skin and gravy—and that’s where most of the fat and calories lie. This salty-spicy-sweet rub keeps the meat lean but still plenty of flavor. This recipe easily converts to a 3 - 4 pound roasting chicken. Just cut the seasonings in half. The instructions include cooking time. Combine sugar and seasonings and rub on the breasts, thighs, legs and inside cavity. Tie turkey/chicken legs with kitchen string and place bird on the rack of a roasting pan. 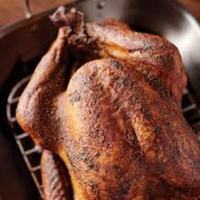 Roast turkey for 40 minutes; roast chicken for 30 minutes. Then reduce oven temperature to 375°F and loosely tent the breast with foil. Continue roasting until a meat thermometer reads 165°F when thigh is probed; approximately 1 – 1 ½ hours longer. Let turkey rest 30 minutes and chicken rest 15 minutes before carving. Paprika is a Hungarian pepper blend and it comes in sweet or hot. The smoked variety, is typically labeled smoked Spanish paprika. Generally grocery stores carry "paprika," consider this the sweet variety unless otherwise labeled. Kosher salt is a coarse grain salt. You can substitute table salt: Turkey = 1 1/4 tsp. & Chicken = 1/2 tsp. This would be fabulous grilled or cooked on a rotisserie. Cook to same internal temp. And time. Avoid turkey/chicken labeled “basted” or “self-basted.” they are injected with a solution that can contain everything from butter to salt and have unappealing texture, not to mention lots of unnecessary sodium per serving. Thank You, it means a lot coming from you. Since it's quite the process to remove the skin, I'll keep it on most of the time. I just remove any visible signs of fat and poke the skin around the dark meat to help the fatty juices drain.